How the food is prepared determines a lot the preference of food in certain regions. For instance the communities who put ash in milk might not be viewed in good faith by other communities who normally take pure milk. Also some communities are rich in recipes while others still use the basic recipes for instance in the preparation of pumpkins, some community boil them and consume them. This has resulted to some people disliking the pumpkin, not because pumpkins are bad per se but due to the preparation methods. Hence some communities go a step in value addition of pumpkin by making pumpkin and seed flour ,which is then used to make soups, chapatti, maandazi, seed flour is rich in minerals especially zinc which is very important in keeping men very potent. Under the food security project in Salabani Location in Marigat district which is supported by Mani Tese and implemented by NECOFA, village women were trained alternative methods of cooking pumpkin and Lablab beans (Njahi). How food is prepared gives it the taste and its consumption should be a pleasurable moment. The morning of 27th July, 2013 saw more than 20 women from Longiron and Lekiricha benefitting from the culinary lessons. utensils, charcoal and water. After a gathering of about 7 women, Monica who was the facilitator started by explaining in details the importance of value addition in pumpkin and other foods that are less consumed but have high nutritional values. The culinary lessons had an impact and have become the talk of the village in the past few weeks; women who were there still in disbelief while those who missed the occasion wishing they had been there. · The ingredients includes; pumpkin, wheat flour and cooking oil. The objective of exhibiting at the show was to take advantage of newly established county to share ideas and experiences with other stakeholders. In the 5 days event, Slow Food Central rift Convivium and Necofa in collaboration with other partners had the chance to showcase their products and programmes besides exchanging new ideas. Notably on the stand were presidia products from Lare pumpkin and Mau stinging nettle.The farmers were able to showcase their produce while the schools showcased the activities they are undertaking in gardening and environmental conservation. It was an excellent opportunity for the exhibitors, show goers and various stakeholders to interact gain insights into new trends, technologies and methods in agriculture, industry, trade and other related fields. Lot of information, demonstrations, technology transfers and important contacts were available from the many stands of exhibitors. Exhibitions by Necofa were geared towards achieving sustainable food security through increased productivity and value addition on indigenous agricultural products for a healthy nation as well as improved environmental conservation. Farmers working with Necofa had an opportunity to showcase their indigenous products which included; Ogiek pure natural honey from Mau Forest, Mau stinging nettle by Utugi Self Help Group, stevia natural sugar, mixed porridge flour with several ingredients namely: stinging nettle powder, sweet potatoes, oats, maize, groundnuts, barley, amarantha, brush millet, finger millet and sorghum. Nganoini Self Help Group from Lare exhibited pumpkin, Pumpkin seeds, pumpkin seed flour and pumpkin flesh flour. There were variety of foods prepared from these products, among them were: chapatti and mandazi from pumpkin flour and stinging nettle, porridge from pumpkin flour and stinging nettle, pumpkin juice and mukimo from the stinging nettle, millet Ugali,indigenous vegetables and Mursik from the kalenjins. Other products for exhibition were the hyax organic fertilizer, products from Molo wool project by Karunga Women Group, necklaces and bangles made by Sachangwan secondary school environmental club members. There was much to be learnt from the stand which seemed to attract an extremely huge number of people comprising of all races and ages coming to see products and learn more about our organization .All were able to appreciate the nutritional and health benefits of our indigenous agricultural products leading to a high demand for the products as well as our ready prepared foods. Many recommendations were made especially on establishment of more distribution outlets for our products in Nakuru County for continuous supply and also to come up with more indigenous food products. Celebrating World Environment Day June 5th 2013. The World Environment Day is always celebrated under one global theme provided by the United Nations Environment Programme (UNEP). The theme for this year’s World Environment Day celebrations was Think.Eat.Save. Think.Eat.Save is an anti-food waste and food loss campaign that encourages you to reduce your footprint. By celebrating World Environment Day, we remind ourselves and others of the importance of caring for our environment. So think before you eat and help save our environment! It is a day for reminding humanity the importance of the environment and their responsibility towards maintaining its sustainability and quality. Celebrating World Environment Day is about the inspirational power of individual actions for positive change, to guarantee secure, clean and healthy environment for all. The National venue for World Environment Day activities was at Kengen grounds in Naivasha District. The selection of Kengen was based on its relevance to the national theme, given that the district is experiencing high environmental degradation rate, diminishing fish stock in L. Naivasha and forest cover, high population growth, and alarming changes in people’s lifestyles especially within the fishing communities, among others. People in Peril association sponsored community members engaged in the project to decrease degradation of Mau Ecosystem to participate in the event and showcase their contribution towards healthy food and clean environment. Other community groups were sponsored by Network for Ecofarming in Africa and Slow Food Foundation for Biodiversity. The communities showcased their traditional food dishes, and explained on the importance of consuming our local products and producing our food in an environmentally friendly way. The theme encourages us to become more aware of the environmental impact of the food choices we make and empowers one to make informed decisions to reduce food waste, save money, minimize the environmental impact of food production and force food production processes to become more efficient; hence enhancing sustainable development for the present and future generations. In accordance with this year’s national theme, the focus of activities to celebrate World Environment Day were on uplifting people’s mindset and understanding of food choices, processes and footprint, as well as promoting sound environment management practices to save our environment and natural resources. INCULCATING POSITIVE VALUES TO YOUNG GENERATION ON ENVIRONMENT THROUGH ENVIRONMENTAL CLUBS. A school environmental club is a voluntary group comprising of students and teachers (club patrons) of a school which promotes participation of students in learning about and working towards the conservation and sustainability of their environment. They aim at creating awareness on the importance of respecting and appreciating our surroundings. 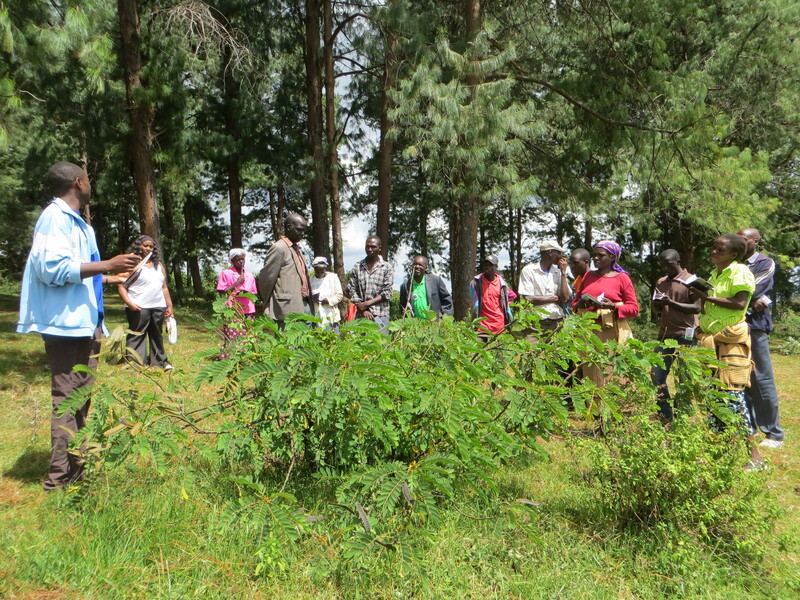 With the support of Ministry of Agriculture, Kenya Forest Service and Ministry of Education in Molo District, Necofa is working with seven schools to “Promote participation of students in Agro forestry and Environmental Conservation” and create awareness about the environmental related issues threatening the existence of the Mau water tower, these schools are:-Mianzini ,Mukinyai, Nyakiambi,Chandera,Mariashoni and Tumaini Integrated secondary schools. >Develop right attitudes among students towards environmental conservation. >Set values and concerns in students towards environmental conservation. Necofa believes that engaging and participation of students in environmental conservation and protection will help students to lead, identify and solve environmental problems in their respective localities, by providing an opportunity for practical side of the environmental conservation through tree nursery establishment, tree planting in water catchment areas, establishment of woodlots and botanical gardens in schools, donate tree seedlings to the community and going for excursions in forests to see the different tree species as well as reconnecting with the natural forest environment, this will enable them appreciate and respect nature. The Environmental Clubs will also promote creative and critical thinking through inter schools essay writing and creation of environmentally friendly innovations. >Getting school boards involved, they will ensure sustainability of the project after the phase out period. >providing tools and equipments for the clubs. >Offering refresher trainings follow ups beyond the project period as well as training for new club members. >Involving key government stakeholders like Ministry of Agriculture and Kenya Forest Service, the club patrons, Ministry of Agriculture, Kenya Forest Service will act as the resource persons for the clubs. This will enable the students to participate fully in conservation efforts as well as better understanding on biodiversity issues..
Co operating and networking with other environment clubs and communities through exchange visits and inter-school competitions will motivate the students and give them new ideas to better their efforts. Natural fertilizer, often called compost, provides the food needed for a plant to grow after a seed has germinated in the soil. This food consists of plant nutrients. The most important, called macro, of these nutrients are nitrogen (N), phosphorus (P) and potassium (K). There are also many other nutrients needed by plants in small quantities, e.g. copper (Cu) manganese (Mn), magnesium (Mg), iron (Fe), sulphur (S) and others. These are called micronutrients or trace elements. Natural fertilizer also provides organic matter called humus for the soil. Humus is a black or brown spongy or jelly-like substance. It helps the soil have a good structure to hold water and air. One of the best natural fertilizers is mature compost because it feeds the soil with humus and plant nutrients. The growing plants take their nutrients from the top layers of the soil where their roots grow. Plant nutrients are lost from the soil when they are washed down (leached) below the top soil, or when the top soil is eroded. Plant nutrients are also lost with the crops when these are harvested. When the surface of the land is broken up for farming, the soil is often eroded: it is blown away by the wind or washed away by rain and floods. The soil also loses much of its carbon content as carbon dioxide (CO2) into the atmosphere, thus contributing to climate change. The soil that is left becomes poor in plant nutrients so the crops do not grow well and give a good yield. But if the plant nutrients and carbon are returned to the soil, it can continue to grow good crops as well as contribute to slowing down the negative impacts of climate change. Throughout the world there are many options for replacing the plant nutrients lost from soil, but, in our case and in many other parts of Sub-Saharan Africa where most of the agriculture is done by smallholder farmers, the best option is compost produced by human labour using the natural materials available to farmers and others, such as students and youth, from their surroundings. Good quality compost can also be made from organic household wastes in urban areas and be used to grow healthy vegetables in gardens at home or by school environment club or youth group members. 	The decayed and decomposed remains of living organisms—humus. Natural soils consist of combinations of sand, silt and clay. The sand holds some plant nutrients and helps provide good drainage of excess water from a soil. Silt holds more plant nutrients and helps to hold water in the soil. Clay holds even more plant nutrients and water, but has little air. Loam or loamy soil contains a balance of sand, silt and clay. In a healthy soil, all these particles are coated with a layer of humus. This gives the soil its brown colour, good smell and structure. The humus also holds and helps keep plant nutrients and water in the soil. The nutrients in the humus are released slowly and constantly, as long as there is enough moisture. 	Contributes to a good soil structure. A healthy soil contains 12 or more percent of carbon, i.e. organic matter. The organic matter is the source of energy for the bacteria, fungi and other organisms in the soil. These organisms break down dead plant and animal remains releasing carbon dioxide, water and mineral salts, including nitrates, phosphates, etc. which are the nutrients for growing plants. Some of the water in the soil is held tightly by the soil particles, especially by the clay, and plants cannot use it. Other water moves more freely through the pores, and this is available for plant growth. Humus acts as a water reservoir for the plant roots and other organisms in the soil. It can hold up to six times its own weight in water. The air in the soil has much more carbon dioxide than the above ground atmosphere. This is because the plant roots and the other living things in the soil produce carbon dioxide when they ‘breath’, but the movement of air in the soil is slow and the carbon dioxide does not move out into the air as fast as from animals living above ground. There are many organisms that live in the soil, The bacteria and fungi are particularly important in breaking down plant and animal waste materials, and making plant nutrients available. Many fungi and bacteria also help in transferring nutrients from the soil to the roots of plants. The larger animals, worms, beetles, etc. help break down dead things into a condition that the bacteria and fungi can digest. These animals also move and mix the soil, sometimes dramatically like earthworms and termites. In a healthy soil, there is a very large mixed population of all these organisms. They each have a role to play in keeping the soil healthy, and hence, also the crops that grow on the soil. Pests are not usually a problem in a healthy soil. Thus, healthy soil produces healthy food. 2.1 Why is compost important? 4) Makes micronutrients and trace elements available to plants. 2.2 What can compost be used for? 1) It provides plant nutrients that are released throughout the growing season. The plant nutrients are released when organic matter decomposes and is changed in to humus. The plant nutrients dissolve in the water in the soil and are taken in by the roots of the crops. 2) It improves soil structure so that plant roots can easily reach down into the soil. In sandy soil the humus makes the sand particles stick together. This reduces the size of the spaces (pores) so that water stays longer in the soil. In clay soils, the humus surrounds the clay particles making more spaces (pores) in the soil so the root systems of plants can reach the water and nutrients that they need, and air can also move through the soil. Therefore, because heavy clay soils become lighter, and sandy soils become heavier, soil that has had compost added to it is easier to work, i.e. to plough and dig. 3) It improves the moisture-holding capacity of soil. The humus is a dark brown or black soft spongy or jelly-like substance that holds water and plant nutrients. One kilogram of humus can hold up to six litres of water. In dry times, soil with good humus in it can hold water longer than soil with little humus. In Ethiopia, crops grown on soil with compost can go on growing for two weeks longer after the rains have stopped than crops grown on soil given chemical fertilizer. When it rains, water easily gets into the soil instead of running off over the surface. Water gets into the subsoil and down to the water table so that runoff and thus flooding is reduced, and springs do not dry up in the dry season. 4) It helps to control weeds, pests and diseases. When weeds are used to make compost, the high temperature of the compost-making process kills many, but not all, of the weed seeds. Even the noxious weed, Parthenium, has most of its seeds killed when it is made into compost following the instructions given in this booklet. Fertile soil produces strong plants able to resist pests and diseases. When crop residues are used to make compost, many pests and diseases cannot survive to infect the next season’s crops. Water can enter the soil better and this can stop showers building up into a flood. This also reduces splash and sheet erosion. Soil held together with humus cannot be blown away so easily by wind. 6) Compost helps farmers improve the productivity of their land and their income. It is made without having to pay cash or borrow money, i.e. farmers do not have to take credit and get into debt like they do for taking chemical fertilizer. But, to make and use compost properly farmers, either individually or working in groups, have to work hard. 2.3 What is needed to make compost? 1) Weeds, grasses and any other plant materials cut from inside and around fields, in clearing paths, in weeding, etc. 2) Wastes from cleaning grain, cooking and cleaning the house and compound, making food and different drinks, particularly coffee, tea, home-made beer, etc. 3) Crop residues: stems, leaves, straw and chaff of all field crops—both big and small—cereals, pulses, oil crops, horticultural crops and spices, from threshing grounds and from fields after harvesting. 4) Garden wastes—old leaves, dead flowers, hedge trimmings, grass cuttings, etc. 5) Dry grass, hay and straw left over from feeding and bedding animals. Animal bedding is very useful because it has been mixed with the urine and droppings of the animals. 6) Dropped leaves and stems from almost any trees and bushes except plants which have tough leaves, or leaves and stems with a strong smell or liquid when crushed, like Eucalyptus, Australian Acacia, Euphorbia, etc. However, we have found farmers making good quality compost including stems of Euphorbia. 7) Stems of cactus, such as prickly pear, can be used if they are crushed or chopped up and spread in each layer in small quantities. They are also a good source of moisture for making compost in dry areas. When the compost is made correctly, the spines are destroyed. Enough water is needed to wet all the materials and keep them moist, but the materials should not be made too wet so that they lack air and thus rot and smell bad. Both too little and too much water prevent good compost being made. 	Collected wastewater, e.g. from washing pots and pans, clothes, floors, etc. However, it should not contain detergents (washing powders and liquids such as Omo). Water can also be collected from ponds, dams, streams and rivers, particularly if men and boys are willing to do it. It is not fair to expect women and girls to collect all the water needed to make compost as they also have to collect all the water for cooking and drinking in the home. 1) Dung and droppings from all types of domestic animals, including from horses, mules, donkeys and chicken, from night pens and shelters, or collected from fields. 2) Chicken droppings are important to include because they are rich in nitrogen. Catch urine in a container from animals when they wake up and start moving around in the morning. Provide a container—like an old clay pot or plastic jerrycan—in the toilet or latrine where people can pass or put their urine. Night soil (human faeces): almost all human parasites and other disease organisms in human faeces are killed by the high temperatures when good compost is made. Micro-organisms (fungi and bacteria) and smaller animals (many types of worms, including earthworms, nematodes, beetles and other insects, etc) turn waste materials into mature compost. These are found naturally in good fertile soils like those from forests and woodlands, old animal dung, and old compost. Adding any of these to new compost helps in the decomposition process. Adding compost making aids is like adding yeast to the dough to make bread. The farmers in Ethiopia call all these materials the ‘spices’ to make good compost. Including dry materials in the compost, e.g. old leaves and stalks, provides space for air to circulate inside the compost. Air is needed because the soil organisms need oxygen. Decomposition of organic wastes produces heat. Compost needs to be kept hot and moist so the plant and animal materials can be broken down quickly and thoroughly. Heat destroys most of the weed seeds, fungal diseases, pests and parasites. Both carbon and nitrogen are needed to make good compost. They are used by the micro-organisms to grow and multiply, and to get energy. Some of the carbon is converted to carbon dioxide, and this escapes to the atmosphere. Most of it remains and becomes humus, and the nitrogen becomes nitrates. Methane is not produced if there is a good supply of air to the organisms carrying out the decomposition process. Materials with good nitrogen content help in making good compost, but they should be less than the carbon-containing materials. Carbon-containing materials should always be more than those containing high nitrogen, i.e. a ratio of 2:1 upto 3:1 is the best. A good balance of carbon and nitrogen helps make good compost. Table 1 gives the average carbon-to-nitrogen balance for some types of composting materials. With Nitrogen as 1, high figures for the carbon in the carbon-to-nitrogen column indicate high carbon content. These items are good for making compost. Items with low carbon content, like urine and chicken manure, are useful to provide nitrogen. But they must be mixed with materials with high carbon content. 1) When there is enough air and moisture in the compost, nitrogen-containing materials are broken down and the nitrogen is changed to nitrates that can be used by plants. 2) When there is too much water and little air, the nitrogen is changed into ammonia. This is a gas that escapes from the compost, and gives the compost a bad smell. 3) When there is a bad smell, the compost needs to be turned over bringing the top to the bottom and the bottom to the top, and mixing in more dry materials and some good soil. This puts more air into the compost, which stops the process of making ammonia so that proper mature compost can be made. Dry materials give structure to the compost making process; they provide space for air to circulate so that the micro-organisms can be active and produce heat. Green plant materials provide moisture for compost making; they give water and nutrients to the micro-organisms so that they multiply and break down the organic materials into humus. Crop straws absorb water without changing their physical structure. They are good for keeping air in the compost, but they do not mix easily with other materials and decompose slowly. Grass and other green materials have usually lost water and wilted before they are put into the compost. They can hold moisture longer in a compost pit than in a compost heap. Water is essential for compost preparation. 1) Sufficient moisture helps for quicker decomposition because it is essential for soil organism to be active. 2) Excess water causes rotting of the materials and creates a bad smell. 3) Without enough moisture the decomposition process slows down and the materials will not be changed into compost. This shows that moisture and air must be balanced to make good compost. Farmers quickly learn how to judge the amount of water needed to be added in making compost. Compost should have sufficient air. 1) When there is sufficient air, oxygen enters the compost heap. When there is enough oxygen, special bacteria can convert nitrogen into nitrate, the materials are decomposed properly and there is a good smell. 2) If there is not enough air and too much water, the nitrogen is converted into ammonia. The ammonia escapes into the air removing nitrogen from the compost and making it smell bad. 3) If there is excess air and too little water, the materials dry up and do not decompose to become compost. 1) Animal dung contains water, nitrogen, phosphorous and potassium, as well as micro-nutrients. 2) Animal dung and urine are very necessary to prepare good quality compost—urine especially is high in potassium and nitrogen. 3) Both dung and urine help to produce a high temperature so that the materials decompose into compost quickly and easily. 4) Urine, in particular, accelerates decomposition. Good top soil and old compost. These contain bacteria, fungi and many small animals to work on breaking down the materials into mature compost. Ashes from all types of plant materials except charcoal are good to mix in because they contain phosphorous, potassium, and many micro-nutrients like zinc, iron and magnesium. Ash is important in making compost, but it should be added in small amounts or mixed with the dry plant materials. If ash is added in a large amount, it stops the movement of compost-making organisms, water and air and finally prevents the decomposition process from continuing. Heat is produced by the action of bacteria and fungi on the plant and animal materials, and their activity keeps the compost hot. Covering compost with a black plastic sheet can also absorb the heat from the sun and stop it escaping so that the compost making process goes fast. Large (Macro) soil organisms: Look for larger organisms, like earthworms, beetles, and chafer beetle grubs in old moist compost, old animal dung or good top soil and add these to the compost making materials as they are. Do not dry or sieve them as this will kill them. They help speed up the composting process and ensure that good quality compost is produced. Make a mixture of dry top soil, old compost and ashes. Then crush it and, if possible, sieve it so it is like salt or a fine powder. Mix the powder with fresh composting materials, particularly with dry or green plant materials like grass and/or straw, and put this in layers between the other materials. Do NOT put the compost making aid material as a layer by itself. It needs to be mixed with the other materials so it can accelerate the compost making process. Ash is good as it contains minerals, BUT if you put a high quantity in one layer, the minerals are strongly concentrated and can slow down or stop the micro-organisms making compost. Mix the ash with the dry or green plant materials. The production of good quality mature compost depends on the number and types of micro and macro-organisms living in the soil. These are living organisms that require air, moisture and heat in the compost heap so that they can live, work and multiply / reproduce. Compost materials supply food and energy (starch, soluble sugars, carbohydrates, amino acids) for the micro-organisms. In the presence of air supplying oxygen, and moisture, the micro-organisms convert the available food into humus and soluble plant nutrients, which stay in the compost heap, and carbon dioxide, which diffuses out into the atmosphere. However, most of the carbon in compost materials stays in the humus and only a small amount leaves as carbon dioxide. As the micro-organisms grow and multiply, they produce heat which speeds up the compost making process. Heat also kills many weed seeds, pests, parasites and diseases from the fields, and in the animal dung and human faeces. The heat ensures that healthy mature compost is produced. There are two main methods for preparing compost. One is called the Indore method and the other is the Bangalore method. The names come from districts in India where the compost making processes were first developed. The difference between the two methods is in the way the materials are put together and in the time taken for completing the compost heap or filling the pit. The Indore method can be prepared either in a pit or as a heap or pile above the ground, but its preparation must be completed in less than a week. The complete Indore method uses a sequence of three layers of materials: dry plant materials, green plant materials, animal manure and some soil. It is suitable for times and places where there are plenty of materials to make the mature compost, and labour, such as in a school or with a farmers’ group, to put them together quickly. The NADEP method is like the Indore method except that the tank is filled in one or two days and it always includes animal manure. This method needs a lot of work, but it produces very high quality mature compost without any more labour after the NADEP tank has been filled and sealed. The Bangalore method is prepared in areas where composting materials and water availability are limited, and labour is also limited. The materials can be collected over a week or more, and then the new layers are made until either the heap is about 1 to 1.5 metre tall, or the pit is full. The Bangalore method usually uses only two layers of materials: dry plant materials and green plant materials. It is very suitable for making compost from household wastes, or in farms where there are no domestic animals. Both the Indore and the Bangalore methods can include animal manure as an additional layer. Including animal manure ensures the best quality compost. But good quality compost can be made even without animal manure, i.e. just from plant materials and kitchen wastes. 1)	Decide when and what method to use to make the compost. 2)	Look out and search for composting materials that can be collected and carried to the compost-making place. 3)	Find out who will provide the water, and how. 4)	Decide if it is possible to collect and use urine. 5)	Be prepared to give time and effort, i.e. work hard, to prepare good quality compost. 6)	Set a target for the area of farmland or garden to be covered by the mature compost. Adding mature compost to a small field or even a small area in a field and then planting it with a high value crop can show good economic returns in a year. 7)	Collecting composting materials, layering or piling, and mixing are the main tasks during compost making. These need physical and mental preparation to overcome the burden of hard work, but it is only for a short time. 8)	Seeing good crops grow well and getting good yields from well composted soil is very rewarding. In Ethiopia, and other places with warm to hot climates, mature compost can be prepared in three to four months. In colder places, decomposition to make mature compost can take from six months to a year. Mamma Yohannesu was an old woman living with her grandson. She had a very small field of about 10 x 25 m near her house. The soil was rather sandy. She managed to make about 5 sacks of compost which she put on this field when her neighbour ploughed it for her. She planted the field with finger millet. In most of the field she scattered the seed, but in a plot of 5 x 5 m she brought and planted young finger millet seedlings she had grown in her house garden. She got a fantastic yield for her efforts — equivalent to 2.8 tonnes/ha for the directly sown finger millet and 7.6 tonnes/ha from the transplanted seedlings. 1) It is good to make a heap in the rainy season when there is plenty of green plants, such as weeds, getting water is easy or the materials are naturally wet, or where there is plenty of water available. 2) The compost heap will be on the ground with its base in a shallow trench to hold the foundation layer. 3) It should be in a place where it can be protected and get covered with leaves or straw or plastic during the rains so that the materials are not damaged or washed away. 4) It can be made under the shade of a tree and covered with wide leaves or plastic in order to protect the heap from high winds. 5) After the rains stop, keep the heap covered and check regularly to see if the moisture and temperature are correct, as described later in the section on follow-up. 1) This is good anytime of the year where moisture is limiting, and is the best way to make compost after the rains have finished and during the dry season. 2) Prepare and dig the pit, or better still, a series of 3 pits, when the land is moist and easier to dig, and/or when there is a gap between other farming activities. 3) If possible, make the compost immediately at the end of the rainy season while there are plenty of green and moist plant materials. 4) In the dry season, make the pit near a place where water can be added, e.g. next to the home compound where waste water and urine can be thrown on the compost materials, or near a water point, e.g. a pond, or near a stream where animals come to drink. 5) Mark the place of the pit with a ring of stones or a small fence so people and animals do not fall into it accidentally. The Indore compost preparation method is done over a short period of time and uses a systematic way of putting the materials together, i.e. in layers. This method is most suitable for the rainy season when there are plenty of materials, e.g. weeds, to put into the compost. However, the place for making compost should be well-drained and easy to protect from floods and excess rain. The compost can be made either by piling in a heap or heaps, or in a pit or pits. This method can also be used by vegetable growers when they should clean their fields after harvesting their crops and before the next crop is planted. The residues left after the crop is finished and harvested, such as stems and leaves from pumpkins, potatoes, tomatoes, chilli peppers and courgettes/zucchini, leaves and stalks from cabbage, etc. and any damaged crops that cannot be sold or eaten, should be collected together and organized for making compost. Using these left over materials for making compost prevents the pests and diseases in the old plants and diseased fruits from going on living so that the next crop does not get so easily damaged. 1) The site should be accessible for receiving the materials, including water and/or urine, and for frequent watching/monitoring and follow up. 2) The site should be protected from strong sunlight and wind, e.g. in the shade of a tree, or on the west or north side of a building or wall. 3) The site should be protected from high rainfall and flooding. 1) Clear the site of stones, weeds and grasses, but do not cut down any young trees. Instead, put the site so it is in the shade of the tree(s). The tree(s) will grow, provide shade and protect the compost heap. 2) Mark out the area for the compost heap. A minimum area is a square of 1.25 m x 1.25 m. If it is smaller than this, the heap will dry out quickly so compost will not be made properly. The area can be larger, up to 3 m x 2.5 m.
3) Dig a shallow trench in the ground the same size as the compost heap. Make the trench about 20-25 cm deep. The bottom and sides of the trench should be smeared with water or a mixture of cow dung and water. This seals the pit so that moisture with nutrients do not leak out of the base of the compost heap. 4) The foundation layer of compost making materials is placed in the trench or pit. 5) The trench holds moisture during the dry season. 6) Materials are added in layers to make the heap, described in more detail below. 1) Dry plant materials, e.g. strong straw and stalks of maize and sorghum, which are thick and long, are used for the foundation. These need to be broken into short lengths (about 10-15 cm long). The stalks can be crushed, and then chopped. If possible let cattle lie down or sleep on them for one night. Walking cattle over the stems and stalks, as in threshing, is a good way of breaking up the stalks. 2) Spread the dry materials evenly over the bottom of the trench to make a layer 15-25 cm thick, as deep as a hand. Then sprinkle water with a watering can or scatter water evenly by hand over the dry plant materials so they are moist, but not wet. 3) The foundation layer provides ventilation for air to circulate, and excess water to drain out of the upper layers. Layer 1: A layer of dry plant materials, or mixture of dry plant materials with compost making aids (spices) like good soil, manure and/or some ashes. The layer should be 20-25 cm thick, i.e. as deep as a hand. The compost making aids (spices) can be mixed with the water to make slurry. Water or slurry should be scattered by hand or sprinkled with a watering can evenly over this layer making it moist but not soaking wet. Layer 2: A layer of moist (green) plant materials, either fresh or wilted, e.g. weeds or grass cuttings, plants from clearing a pathway, stems and leaves left over from harvesting vegetables, damaged fruits and vegetables. Leafy branches from woody plants can also be used as long as the materials are chopped up. The layer should be 20-25 cm thick. Water should NOT be sprinkled or scattered over this layer. Layer 3: A layer of animal manure collected from fresh or dried cow dung, horse, mule or donkey manure, sheep, goat or chicken droppings. The animal manure can be mixed with soil, old compost and some ashes to make a layer 5-10 cm thick. If there is only a small quantity of animal manure, it is best to mix it with water to make slurry, and then spread it over as a thin layer 1-2 cm thick. 2) Layers are added to the heap in the sequence, Layer 1, Layer 2, Layer 3, until the heap is about 1-1.5 metres tall. The layers should be thicker in the middle than at the sides so the heap becomes dome-shaped, which helps rainwater entering the pit. 3) Layers 1 and 2 are essential to make good compost, but Layer 3 can be left out if there is a shortage or absence of animal manure. 4) Place one or more ventilation and/or testing sticks vertically in the compost heap remembering to have the stick long enough to stick out of the top of the heap. Ventilation and testing sticks are used to check if the decomposition process is going well, or not. A hollow stick of bamboo grass (Arundo donax) or bamboo makes a good ventilation stick as it allows carbon dioxide to diffuse out of and oxygen to diffuse into the heap. A testing stick is needed as it can be taken out at regular intervals to check on the progress of decomposition in the heap. The finished heap needs to be protected from drying out, and also from animals pushing into it and disturbing it. 1) The covering layer can be made of wet mud mixed with grass or straw, with or without cow dung, or wide leaves of pumpkin, banana, fig trees, etc, or from plastic, or any combination of these materials, i.e. mud plaster covered with leaves or plastic, or leaves covered with plastic. 2) The cover should be put on both the sides and the top of the heap with only the ventilation stick coming out of the top. Helps keep heat inside the compost making heap. See the section on follow-up for how to check on the heat and moisture in the compost. 4) The compost heap can also be protected by putting a ring of stones or making a small fence around it. 5) The compost heap is best left untouched until there is mature compost inside it, or it can be turned over, as described for the pit method. If the compost is turned over, water should be sprinkled over the layers to keep all the materials moist. It is not necessary to try and keep the original different layers when turning over the compost—it is best if all the materials can be well mixed together, then added in layers about 20-25 cm thick and water sprinkled or splashed over them. 6) A mature compost heap is about half the height of the original heap, and the inside is full of dark brown or black substance, humus, which smells good. When the compost is mature, it should be very difficult to see the original materials. 7) This mature compost can be used immediately in the field, or it can be covered and stored until the growing season. When it is put in the field, it should be covered quickly by soil so the sun and wind do not damage it, and the nitrogen does not escape to the atmosphere. Therefore, it is best to put compost on the field just before ploughing, or at the same time as sowing the crop. For row planted crops, it can be put in the furrow with the seed. For transplanted crops, it can be put in the hole with the seedling. The Indore pit method is best done at the end of the rainy season or during the dry season. It is important to make the pits where there is sufficient water available; for example, by a pond, small dam, run-off from a road or track, etc. Women and girls should not be expected to carry water just for making compost. Waste water and urine from people and animals can be collected in old containers, and used in making compost. 1) After harvesting is complete, farmers can arrange their time to make compost including working together in groups according to their local traditions to share their labour. 2) If farmers have a biogas digester, the bioslurry from the digester can be used to make high quality compost at any time of the year, but particularly during the dry season. 3) The pits can be filled 2 or more times so that a large quantity of compost can be made over the duration of the dry season. 4) If pit compost is made during the rainy season or in very wet areas, water can get into the bottom of the pit. This will rot the materials producing a bad smell and poor quality compost. In wet areas it is better to make compost through the piling method. 5) Poor quality compost will not be productive and this can discourage farmers and others from trying to make better quality compost. 6) It is very important to have a frequent follow up and control of the balance of air and water in the materials being decomposed to make compost. 1) The site should be accessible for receiving the composting materials, including water and urine, and for frequent watching/monitoring and follow up. 2) The site should be protected from strong sunlight and wind. It should be in a protected area, for example, in the shade of a tree, or on the west or north side of a building or wall. 3) The pit or pits should be marked or have a ring of stones or small fence around it or them so that people and animals do not fall into it or them. 4) The site should NOT be where floods can come. The pits can be dug as they are needed – see Table 2 showing the flow of work. If a farmer and his/her family feel they have limited capacity, they can dig 1 pit of the above size, but then they should probably make compost using the Bangalore method (see next section). Smaller pits usually dry out too quickly so good quality compost is not be made, and this will discourage the farmer from making and using compost. Pits deeper than 1 metre can be cold at the bottom and the micro-organisms cannot get enough oxygen to work properly. If compost is prepared by a group of farmers or students in an environment club or youth group, they can make a wider and/or longer pit that can supply all the families in the group. It also depends on the amount of composting materials they are able to collect and bring to the pit. See also the sections on Trench Composting and the NADEP method, which are more suitable for compost making by groups, and where large quantities of composting materials are readily available. After the pit or pits are dug, they should be checked carefully to make sure there is no leakage of water into the pit which could spoil the compost making process. Before the pit is filled, the bottom and sides should be covered with a mixture of animal dung and water – slurry. If animal dung is not available, a mixture of top soil and water can be used. This plaster helps seal the sides of the pit so that moisture stays in the compost making materials. 1) Dry plant materials, e.g. strong straw and stalks of maize and sorghum, which are thick and long, are used for the foundation. These need to be broken into short lengths (about 10-15 cm long). The stalks can be crushed, and then chopped. If possible let cattle lie down or sleep on them for one or two nights. Walking cattle over the stems and stalks, as in threshing, is a good way of breaking up the stalks. The cattle will add their dung and urine to the stalks making them more valuable for making compost. 2) Spread the dry materials evenly over the bottom of the pit to make a layer 20-25 cm thick. Then sprinkle water with a watering can or scatter water evenly by hand over the dry plant materials so they are moist, but not wet. 3) This is a very important layer in making pit compost as it makes sure that air can circulate through to the bottom of the pit. Layer 1: A layer of dry plant materials, or mixture of dry plant materials with compost making aids (spices) like good soil, manure and/or some ashes. The layer should be 20-25 cm thick, i.e. about the depth of a hand at the sides. The compost making aids can be mixed with the water to make slurry. Water or slurry should be scattered by hand or sprinkled with a watering can evenly over this layer. The layer should be moist but not soaked. Layer 2: A layer of moist (green) plant materials, either fresh or wilted, e.g. weeds or grass, plants from clearing a pathway, stems and leaves left over from harvesting vegetables, damaged fruits and vegetables. Leafy branches from woody plants can also be used as long as the materials are chopped up. The layer should be 20-25 cm thick at the sides. Water should NOT be sprinkled or scattered over this layer. Layer 3: A layer of animal manure collected from fresh or dried cow dung, horse, mule or donkey manure, sheep, goat or chicken droppings. The animal manure can be mixed with soil, old compost and some ashes to make a layer 5-10 cm thick. If there is only a small quantity of animal manure, it is best to make slurry by mixing the dung in water, and then spread it over as a thin layer 1-2 cm thick. 2) Layers are added to the pit in the sequence, Layer 1, Layer 2, Layer 3, until the pit is full to the top with the middle about 30-50 cm higher than the sides. The layers should be thicker in the middle than at the sides so the top becomes dome-shaped. Layers 1 and 2 are essential to make mature compost, but Layer 3 can be left out if there is a shortage or absence of animal manure. 3) Place one or more ventilation and/or testing sticks vertically in the compost pit remembering to have the stick long enough to stick out of the top of the pit. Ventilation and testing sticks are used to check if the decomposition process is going well, or not. A hollow stick of bamboo grass (Arundo donax) or bamboo makes a good ventilation stick as it allows oxygen to diffuse into the pit. A solid stick is important as it can be taken out every few days to check on the progress of decomposition of the materials in the pit. After the pit is full of compost making materials, the top should be covered with wet mud mixed with grass and/or cow dung, and/or wide leaves such as those of banana, pumpkin or even from fig trees, and/or plastic so the moisture stays inside the pit, and rain does not get in to damage the decomposition process. NOTE: Mark the place and/or cover the top with branches so animals and people do not tread on the cover and break it. The progress in making compost should be checked regularly by taking out the ventilation or testing stick and checking it for heat, smell and moisture. The inside of the pit should be hot and moist with a good smell. The top of the pit will also sink down as the composting materials get decomposed. 1) In warm climates, about one month after the pit has been filled the compost can be turned over and checked. 2) In cold climates, the compost making materials take two or more months to start to decompose well. The rate of decomposition can be checked through the use of the testing stick. 3) A good farmer or gardener will soon learn how to judge the best time to turn over her or his compost. Table 2 and show the sequence of activities for digging, filling and turning over compost in the 3-pit system. This system spreads out the work so that a farmer who wants to have a good quantity of quality compost can plan and prepare it before the growing season. The cover is removed and all the materials are turned over into the second pit, i.e. from pit A to pit B. It is important to put the materials from the top of pit A into the bottom of pit B, and so on with the materials from the bottom of pit A getting to the top of pit B. The materials can be mixed together, but they should be added in layers 20-25 cm thick and sprinkled with water to make sure they stay moist, but NOT soaked. At the same time check that the moisture and air balance is correct. If the materials are too dry, more green materials should be added and/or water should be sprinkled over them as they are put into the pit. If the materials are too wet, add more dry plant material in layers between the wet decomposing materials. If the compost making is going well, you will find that the materials from pit A do not completely fill pit B. You will also see the white threads of fungi and many kinds of small organisms, including termites that are living on and decomposing the composting materials. The composting materials will have started to turn dark brown or black. Pit A can now be filled for a second time with a new lot of composting materials as described above. Both pits should be closed with a layer of mud or leaves and/or plastic, as described above. Again after about another month, the cover over pit B can be opened and the materials turned into pit C, and the cover to pit A removed and the materials in pit A turned over into pit B. At the same time check that the moisture and air balance in the materials is good. If the compost-making process is going well, after two months the materials in pit B should be well decomposed, i.e. dark brown or black, with a good smell and these can be turned into Pit C.
Pit A can now be filled for a third time with new composting materials, if they are available. After a third or fourth month in warm climates, it should be possible to find fully matured compost in pit C. The material should look like good dark soil without any of the original materials visible. However, pit C may be only half full after the first lot from pit B is put into it. In fact, pit C can store all the compost until it is needed. Pit C should always be covered to prevent rain getting in, nutrients getting out and the compost being spoiled. Or, the mature compost can be taken out, piled up and covered to be stored in a dry, cool and shady place until it is needed. It must be covered so that it does not blow away or the nutrients get destroyed by sunlight or rain. The mature compost can be taken out and put on the field just before ploughing, or mixed into the soil immediately by hand. The compost must be covered with soil so that the nutrients, particularly nitrates, are not destroyed by the sunlight. With enough moisture and heat, compost making is fast under Ethiopian conditions. Four months after filling the first pit, it is possible to have compost to use on the land. By the sixth month, a good farmer can accumulate 3 lots of compost, enough for half a hectare of land. The Bangalore method is not as precise or as demanding of hard work as the Indore method because the composting materials are added as they become available. It is highly suitable where there is a shortage of both composting materials and water. It is also the best method for making compost from household waste and/or vegetable gardens. The Bangalore method can be used for both piling and pit methods, but the pit method is preferred in Ethiopia. This is because the pit holds moisture better than the heap, and the wind cannot blow away the materials so easily in the dry season. However, inside house compounds, the piling method is also convenient. 1) Select a site where it is easy to add materials, e.g. inside a house compound. 2) The site should be sheltered from rain and wind. The best is in the shade of a tree, or on the north or west side of a building or wall to be sheltered from sun for most of the day. 3) Clear the site of stones and weeds, but leave trees to grow and give shade. 4) Mark out the length and width of the heap; for example, 1-2 m x 1-1.5 m and dig a trench 20-25 cm deep, i.e. about the depth of a hand, to be at the bottom of the heap to hold the foundation layer and stop it drying out in the dry season. 1) Prepare the foundation layer from dry plant materials such as old straw, stalks of maize and sorghum, or old cabbage stalks, rose and hedge trimmings, etc from gardens. 2) Use straw and maize and sorghum stalks as livestock bedding for one or two nights so that they get broken up and mixed with urine and dung. 3) Collect the materials and put them into the trench to make an even layer 15-25 cm deep. Sprinkle or scatter some water over the layer so it is moist but not wet. 4) Cover the layer with a little soil and some large leaves from banana, or pumpkin, or a fig tree, or even a sheet of plastic to prevent the materials drying out or being blown away. 1) During the week, collect materials and put them in a convenient container such as an old jerry can, or next to the compost heap. Dry plant materials can be mixed with fresh moist ones, or the two types of plant material can be kept separately. The farmers in Ethiopia prefer to mix the dry and moist plant materials together. These materials can come from spoiled animal feed where animals have been stall fed, from cleaning the house and compound, clearing paths, weeding, stems and leaves after harvesting vegetables, preparing vegetables for making food, damaged fruits and vegetables, etc. 2) The dry materials can be used as livestock bedding for one or two nights so they collect urine and dung, and the animals can walk over them to break them up. 3) At the end of a week, remove the large leaves or plastic covering the top of the foundation layer so they can be used again, or leave the leaves to become part of the compost if they are too damaged to be used again. 4) Make a mixture of compost making aids (spices) like good soil, old manure and/or some ashes as a fine powder. Mix these with the dry plant material, or with the mixture of dry and moist plant material. 6) Cover each layer with a thin layer of animal manure or soil and/or big leaves like those from banana or pumpkin or fig trees so that the composting materials do not dry out. Animal manure can be left out if it is not easy to get, but the soil is important. 7) Repeat this process each week, or whenever there are enough materials collected to make one or two new layers, until the heap is about 1-1.5 metres tall. Make the centre of the heap higher than the sides so that the heap has a dome shape. 8) Put a testing and/or ventilation stick into the middle of the heap. Helps keep heat inside the compost making heap. See the unit on follow-up for how to check on the heat and moisture in the compost. 3) The compost heap can also be protected by making a small fence around it from branches. 4) The compost heap is best left untouched until there is mature compost inside it, or it can be turned over, as described for the pit method. If the compost is turned over, water should be sprinkled over the layers to keep all the materials moist. It is not necessary to make the different layers when turning over the compost – all the materials can be well mixed together, then added in layers about 20-25 cm thick and water sprinkled or splashed over them. Where the climate is warm, mature compost can be ready in about 4 months. 1) It should be in a place that is easy to take the materials, including water and urine, to the pit as well as for watching and follow up. 2) The site should be protected from strong sunlight and wind. It can thus be, for example, in the shade of a tree, or on the west or north side of a building or wall. 3) The pit should be marked or have a ring of stones or a fence of branches around it so that people and animals do not fall into it. 4) The site should protected and away from where floods can come. 2) If a farmer and his/her family, or urban household, can collect more compost making materials, the pit can be made longer, but NOT either wider or deeper. 3) If a pit is deeper than 1 metre, the material at the bottom does not get decomposed because many of the micro-organisms cannot live so deep down as the oxygen they need will not reach them. 4) Before any materials are put into the pit, the sides and bottom should be checked to make sure no water is leaking into the pit. 5) The bottom and sides should be plastered with a mixture of fresh animal dung and water, or top soil and water, to seal the surface so that the moisture in the compost materials is kept in the pit. 1) Dry plant materials, e.g. strong straw, stalks of maize and sorghum or tall grasses, as well as rose and hedge clippings from gardens, are used for the foundation. These need to be crushed or chopped or broken into short lengths (about 10-15 cm). If possible, let the domestic animals walk over them and sleep on them for one or two nights so the materials get broken up and mixed with urine and dung. 2) Spread the materials evenly over the bottom of the pit to make a layer 15-25 cm thick. Then sprinkle/scatter water evenly so that the materials are moist, but not wet. 3) This is a very important layer in making compost in a pit as it makes sure that air can circulate to the bottom. 4) Cover the foundation layer with large leaves, e.g. those of pumpkin, banana, fig leaves etc, and/or plastic to keep the material moist. 1) Each week, collect materials and put them in a container such as an old jerry can or pile them next to the compost heap. Mix the fresh moist materials with dry ones. These materials can come from spoiled animal feed, old animal bedding, from cleaning the house and compound, preparing vegetables for food, clearing paths, weeding, stems and leaves after harvesting vegetables, damaged fruits and vegetables, etc. 2) If the farmer has a biogas digester, the bioslurry can be collected also to be mixed with the other materials. The bioslurry is an excellent compost making aid. 4) Make a mixture of compost making aids (spices) like good soil, manure and/or some ashes as a fine powder. Mix these with the dry plant material, or with the mixture of dry and moist plant material. 6) Cover each of the layers with a thin layer of soil and/or big leaves like those from banana or pumpkin or fig trees so that the composting materials do not dry out. 7) Repeat this process each week, or whenever there are enough materials collected to make one or two new layers, until the pit is full. Make the centre of the layers in the pit higher than the sides so that the top has a dome shape. 8) Put a ventilation and/or testing stick into the middle of the pit. The pit full of composting materials needs to be protected from drying out, and also from animals disturbing it. Prevent rainwater from getting inside the pit. Help keep heat inside the pit. 2) The compost pit can be left untouched until there is mature compost inside it, or it can be turned over and checked for the progress in decomposition. The top of the pit will sink down as the compost materials get decomposed. However, if the compost is turned over, it will lose moisture. So, it is best only to turn compost over if there is enough water and/or urine to make it moist again while it is being turned over. 3) The process for turning over the compost from the pit is the same as that described for Indore pit method. 4) In a warm climate, mature compost can be made in 3-4 months. In colder climates, decomposition can take six months or a year. 5) The mature compost can be left covered and stored in the pit until it is needed for adding to the soil. Trench composting is suitable for groups. These can be groups of farming households, environmental clubs in schools, or youth group members who agree to work together to collect the materials, make the compost, and then share it among the members, or use it in their common garden. Trench composting is good for mixed groups of men and women because men can do the heavy work of digging the trench and turning the compost materials, while the women can contribute materials and help carry the mature compost to where it is needed, including their own fields and gardens. 1) Plan to make compost in a trench at the end of the rainy season when there is plenty of suitable compost making materials available from clearing paths and compounds, etc, so that the mature compost is ready for the next growing season, or for making nursery beds for raising tree and vegetable seedlings. 2) The trench should be made at a convenient place for the members of the group to bring the collected materials; for example, near a path used by the members. It should also be under the shade of a tree to protect the people working to make the compost from getting too hot in the sun. In some communities, the people making and turning the compost do it in the evening or even at night to prevent getting overheated. The strong smell that can come from decomposing materials is also reduced in the cool of the evening or night. 2.5 metres or longer if there are plenty of materials, even up to 10 metres long. 1) Mark out the size of the trench. Note: the length of the trench can be increased as more materials become available. 2) Dig down to 0.5–1 m and put the soil in a pile to one side of the trench. The soil is added in layers between the composting materials and/or used to cover the top of the filled trench. 4) Look for and collect dry plant materials, such as long grasses and matting, sorghum and maize stalks to make a foundation layer. Get them broken up by animals walking and lying down on them. Put these materials as a bottom layer in the trench. Sprinkle/scatter water over the dry materials until they are moist, but not wet. add some old compost as a starter (like yeast). 6) Put the mixed materials in the trench in layers, each 20-25 cm thick at the sides and thicker in the middle. 7) Sprinkle/scatter water, or urine mixed with water over the materials, until they are moist but not wet. Any type of wastewater, even after washing clothes with hard washing soap, (but NOT with powder or liquid detergents, such as omo) can be used for wetting. 8) Cover this layer with a thin layer of the soil taken from digging the trench. 9) Repeat this process of making layers until the trench is full and the middle is 25-50 cm higher than the surrounding ground. 10) Mix the soil that was dug out from the trench with straw, grasses, cow dung and water, in the same way as making a mud plaster to cover the walls of a house. Use this mixture to make a complete cover and seal over the top of the compost materials. Regularly check the mud plaster cover and repair cracks or other types of damage. 11) Put ventilation/testing sticks in the compost materials at about 1 metre intervals. 12) Finally, cover the trench with thatching grass or wide leaves of banana or pumpkin or fig trees, and/or plastic to keep in the moisture and heat. 13) Regular use the testing sticks to monitor the progress of compost making. 14) The covered trench can be left untouched for 3-4 months, or longer, by which time mature compost will have been made. Evidence of compost making is seen first in the heat, and then in the fact that the heap shrinks down, and weeds start to grow on the mud cover. 1) After 2 months, the cover can be opened and the compost turned over. At the same time, the moisture balance and decomposition process can be checked. However, if the decomposition process is not complete, the compost will have a strong smell. It is best to do the turning over process during the early morning, or in the evening, or even at night to reduce the smell. 2) Turning over the compost is best done by digging out all the compost from about 50 cm at one end of the trench, and putting this outside the trench. Then the remaining compost is turned over in units of 50 cm into the trench so the materials at the top are put at the bottom and those at the bottom are put on top. The materials taken out from the first 50 cm strip are put back at the end of the trench. This is the same method as that used in double digging a vegetable bed. 3) If the materials are not well decomposed and too dry, water can be sprinkled over the materials as they are turned over. 4) If the materials are too wet and smelling of ammonia, more dry materials can be added in the turning over process. 5) After turning over, the materials need to be covered and sealed as described above. The NADEP method is a development of the Indore method. It is named after its inventor, Narayanrao Pandaripade who was also called ‘Nadepkaka’. This system is suitable for organized groups, such as growers associations, cooperatives, school environment clubs and youth groups, to make large quantities of high quality compost which they can use for themselves, or sell, for example, to vegetable growers, where high levels of nutrients are required. The NADEP method produces nitrogen-rich compost using the least possible amount of cow dung. The system also minimizes problems from pests and diseases, and does not pollute the surrounding area because the compost is made in a closed tank. After the NADEP tank has been filled with compost making materials and sealed, it is left for the decomposition process to take place without any further handling until the mature compost is required. The NADEP method uses a permanently built tank of mud or clay bricks, or cement blockettes. It is, therefore, important to choose the permanent site for the tank with care. 1) Select a site where there is enough space to collect the materials together before filling the tank, and where mature compost can be stored until it is needed. 2) The site needs to be near a source of water. 3) The site should be sheltered from rain, floods and wind. The best is in the shade of a tree, or on the north or west side of a building or wall. However, air must be able to circulate all round the tank. 2) This size of tank requires 120-150 blockettes or mud bricks, four 50-kg bags of cement, and 2 boxes of sand. Five iron rods can be used to strengthen the floor, but they are not essential. 3) The building should be done by a properly qualified mason, i.e. someone who knows how to build such a structure. 4) The floor of the tank is made of bricks or blockettes laid on the ground and covered with a layer of cement. 6) After the tank is built, the walls and floor are covered with a light plaster of fresh cow dung mixed with water, and then the tank is left to dry out. A NADEP tank is filled in one or two days of hard work. It has to be done by a team. 1) Dry and green plant materials—1400-1500 kg (or 14-15 sacks) are needed. Grass, hay or straw that is left over from feeding animals, or that has been damaged by rain, is very suitable. 2) Cow dung or partly dried bioslurry (the discharge from a biogas digester)—90-100 kg or 10 sacks. 3) Dried soil that has been collected from cattle pens, cleaning drains, paths, etc—1750 kg are needed. The soil should be sieved to remove old tins, plastic, glass, stones, etc. Soil that contains cattle urine makes it very productive in the compost making process. 4) Water – the amount varies with the season and the proportion of dry to green plant materials available. However, usually an equivalent amount to plant materials is needed, i.e. 140-150 litres. 5) If urine from cattle and/or people is available, it should be diluted in the proportion of 1 part urine for 10 parts water (1 jug of urine put into 10 jugs of water in a bucket). 6) Before starting to fill the tank, the sides and floor of the tank are thoroughly wetted with slurry made from fresh cow dung mixed into water. First layer: use 100-150 kg of dry or mixed dry and green plant materials to make a layer 15-25 cm thick at the sides, and slightly thicker in the middle. Second layer: Mix 4 kg of cow dung or 10 kg of fresh biogas slurry in 25-50 litres of water and sprinkle or scatter it over the plant materials so they get completely moistened. Third layer: Cover the wet plant waste and cow dung or slurry layer with a layer of 50-60 kg of clean, sieved top soil. 9) Cover the last layer of plant materials with a layer of soil 7-8 cm thick. Make a cow dung plaster and cover the soil so that there are no cracks showing. The top of the filled tank can also be covered with plastic, particularly to protect the compost making process during rainy seasons. 10) After the tank is filled, the progress of compost making can be tested by pushing a stick into the tank through the gaps in the wall. In a school or agricultural college, the students can monitor the changes in temperature by inserting a long thermometer, e.g. a soil thermometer. 11) As the materials decompose in the compost making process, the top of the filled tank will shrink down below the sides of the tank. It is important to keep the contents of the tank moist, i.e. with a moisture content of 15-20%. 1) Check the mud plaster seal on the top of the tank and fill any cracks that appear with cow dung plaster. 2) Pull out any weeds if they start to grow on the surface, as their root systems can damage the cover and take water out of the compost. 3) If the atmosphere gets very dry and hot, such as in the dry season, water can be sprayed through the gaps in the walls of the tank. The decomposition process for compost to be made takes about 3-4 months in a warm climate. When it is mature, it is dark brown, moist, and with a pleasant earthy smell: little can be seen of the original materials that were put into the tank. This mature compost should not be allowed to dry out or it will lose a lot of its nitrogen. However, before the compost is mixed to make nursery soil, it should be sieved. The sieved compost is used in making the soil for the nursery beds, and the remainder is kept and added to a new compost-making process. One NADEP tank of the size described here can produce about 30 tonnes or 300 quintals / sacks of high quality compost. When the compost pit has been filled or the piling of materials is complete, it should be checked regularly to make sure that there is enough but not too much moisture, and that it is getting hot, at least in the first 2-3 weeks. The stick can be pushed in vertically in the centre of the heap so it goes through all the layers. However, it is best if the stick or length of bamboo is place in the centre after the foundation layer has been laid and then the layering process is completed with the stick remaining vertical. The stick must be longer than the height of the heap so that it can be pulled out and examined. The stick or length of bamboo is pushed in vertically through the whole layer, or put in place while the compost pit is being filled. The stick must be longer than the depth of the pit. One week after all the materials have been put in a heap or a pit, and it has been covered, remove the inserted stick and immediately place it on the back of your hand. 1) If the stick feels warm or hot and the smell is good, good decomposition has started. 2) If the stick feels cool or cold and there is little smell, the temperature is too low for good composition. This usually means that the materials are too dry, and some water and/or urine should be added. 3) If the stick is warm and wet, and there is a bad smell like ammonia, this indicates that there is too little air and too much water in the compost. The materials will be rotting and not making good compost. 1) Lift up the top layers and put them to the side of the pit or heap. 2) Sprinkle water or cattle urine or cattle urine diluted with water on the material in the bottom. 3) The put back the material in layers of about 25 cm each sprinkling water or a mixture of water and urine over each. 4) Replace the testing stick and cover the heap or top of the pit with soil, leaves, plastic etc as described earlier. 1) Collect some more dry plant materials and/or some old dry compost. Break up and mix the materials. If old dry compost is not available, use only dry plant materials. 2) Lift off the top of the heap or take out the top half of the materials from the pit and put them on one side. 3) Mix the new dry materials with the wet compost materials in the bottom. 4) Put back the materials from the side of the heap or pit. If these materials are wet and decaying, put in alternate layers of new dry plant materials with the wet materials. 5) If the top materials are moist and brown showing compost making has started, put them back as they are. 6) Put back the vertical testing stick. 7) Do NOT seal the top but make a new test after a week. If the stick is warm or hot and the smell is good, good compost making has started and the heap or top of the pit can be sealed and covered. Testing for heat and moisture should be done every week to 10 days until mature compost is made. Although the quality of compost is best evaluated through the growth and productivity of the plants grown on soil treated with it, it is possible to evaluate compost quality through seeing, touching and smelling. 1) Good quality compost is rich in plant nutrients and has a crumb-like structure, like broken up bread. 2) It is black or dark brown and easily holds moisture, i.e. water stays in it, and it does not dry out fast. 3) It has a good smell, like clean newly-ploughed soil, with a smell somewhat like that of lime or lemon. Mature compost is best stored in a pit or heap until it is needed. If it is kept dry and covered, mature compost can be stored for several weeks without deteriorating. The stored mature compost should be kept in a sheltered place, e.g. under the shade of a tree or in a shed, and covered with leaves and/or soil and sticks to prevent the nutrients escaping to the atmosphere, and animals trampling on and damaging the mature compost heap. Mature compost should be taken to the field early in the morning or late in the afternoon. For crops sown by broadcasting, the compost should be spread equally over the field, or the part of the field chosen to be treated with compost. The compost should be ploughed in immediately to mix it with the soil and prevent loss of nutrients from exposure to the sun and wind. For row planted crops, e.g. maize, sorghum and vegetables, the compost can be put along the row with the seeds or seedlings. For trees, compost is put in the bottom of the planting hole and covered by some soil when the seedling is planted out. It can also be dug into the soil around the bottom of a tree seedling after it has been planted. Time and effort are needed to make good compost, so it is worthwhile to also put in time and effort into using it properly in the field. Improper use: The aim of preparing compost is to increase soil fertility and crop yields. Sometimes, a farmer will try and spread a small amount of compost over a wide area, and then be disappointed when he/she does not see any improvements to his/her soil and crops. If only a small amount of compost has been made, it is best to put it on a small area of land than spread it thinly over a wide area. Every farmer must aim to produce enough compost for her/his particular farmland to get a better yield (return). A guide on how much to add is given in the next section. Compost should not be left exposed to sun and wind on the surface of the soil, but buried immediately. Compost should not be added to empty fields. This is a waste of time and effort. By the time the crop gets sown, the compost will have lost a lot of its nutrients and make the farmer disappointed with his/her effort to make and use compost. Carrying compost: Compost is bulky. For best results a farmers needs to carry up to 30 to 70 sacks (3-7 tonnes) of compost to cover a 1-hectare field. This is between 7.5 and 17.5 sacks for 1/4 ha. The farmers of Adi Abo Mossa near Lake Hashengie in Ofla of Tigray and in Gimbichu of Oromiya Regions have solved this problem by using their donkeys to carry the sacks containing mature compost from the compost pit to the field. Other farmers, in Adi Nefas, have organized the making of compost to be near their fields so they only need to carry the mature compost a short distance. If farmers are seriously convinced about the usefulness of compost, they find their own ways to solve these problems. Bioslurry is the output or effluent produced from a biogas digester plant. Compost prepared from bioslurry can be made continuously throughout the year. The process spreads the labour required throughout the year as long as the farming family feeds the biogas digester regularly, preferably every day. An efficient farmer can make good quality mature compost from bioslurry in two months. The recommended design for a biogas digester plant in Ethiopia includes 2 compost pits to receive the bioslurry. These are filled alternatively, as described below. 1) Compost pit should be constructed near the outlet from the effluent tank so that the bioslurry can flow easily along narrow channels into the pits. 2) There should be a distance of 1 metre or more between the outlet from the effluent tank and the compost pits. 3) The channels should slope gently from the outlet from the digester down to the compost pits so that the bioslurry does not get held back in them. 4) The 2 pits are filled alternatively, i.e. when one compost pit is full, the bioslurry should be directed to the other compost pit. 5) Each compost pit should be 1 m deep. The width and length of the compost pits depend on the size of the biogas digester – see Table 3. 6) The distance between 2 pits should be about 50 cm, so that a person can walk between the two pits. 7) A rim of mud, about 10 cm high, has to be put around the top of the compost pits to stop rain water draining into them compost pits. 8) Compost pits must be shaded either by putting them under a tree and/or making a cover to avoid direct sunlight breaking down the nutrients so they escape as gases. The farmer and his/her family collect compost making materials such as straw, ash, animal bedding and kitchen waste to add to the bioslurry. This is put by the side of the compost making pit and then added as layers between the inflows of bioslurry. 1) Clean an empty compost pit and make sure the walls and floor are without cracks. 2) Put a small layer of composting material such as straw to cover the bottom of the pit. 3) Allow one days’ outflow of effluent bioslurry to flow into the pit so that it completely covers the composting materials. 4) Add another layer of composting materials such as straw, leaves, weeds, grass, kitchen waste over the top of the bioslurry. 5) Repeat 3 and 4 until the pit is filled up, this usually takes about one month if the biogas digester has been fed every day. 6) Cover the top layer of bioslurry in the pit with covering materials such as large leaves and soil to make a seal. 7) Start the process in the next pit. 8) After another one month, the second pit should be completely filled and the first pit will have mature or nearly mature compost in it that can be taken out and stored in safe and covered storage place. 9) Using this system, farmer can produce 12 pits of high quality compost in a year, more than enough for one hectare. Vermi compost is made using worms called Eisenia fetida. These are small red worms that eat organic materials mixed with some soil. The organic materials are ground up inside the worms’ digestive system and mixed with bacteria that also help with decomposing the organic materials. The worms deposit the resulting material as worm castes. The compost produced by the worms is highly concentrated and full of nutrients. It is especially good for vegetable and ornamental flower garden beds. It can also be in seedbeds instead of traditional potting soil. 1) Container of any type and size, such as a plastic barrel or a small pit about 50 cm deep. 2) Bedding for the worms such as cardboard soaked in water for an hour or more and torn into long strips roughly 2 inches wide and laid on the bottom of the container or the pit. The bedding should hold moisture so it helps keep the atmosphere moist for the worms. Vermi-compost worms cannot rest on plastic or bare soil. 3) Food preparation scraps such as potato peel, chopped up fruits, vegetables, coffee grounds and even tea bags. Allow the food scraps to begin to decompose for about a week before giving them to the worms, so that bacteria and fungi start the decomposition process and make the food more easily taken in by the worms. Add new food scraps after the previous food is finished. 4) Red wriggling worms – gently lay them on top of the bedding and close the lid to the bin or put a cover over the pit so they can be in darkness. 5) Moisture – enough moisture is needed to wet the decomposable materials and then keep them soft and moist. 6) Materials NOT to be included in vermi-compost are meat, bones, dairy products and fatty or greasy foods. Where soil fertility has been lost through many years of land degradation, 150-200 kg/ha of chemical fertilizer, such as Urea and DAP (diammonium phosphate) is recommended by the Ethiopian government. This can improve the yield in just one year, often dramatically, if there is enough rain or irrigation water. However, the effects of chemical fertilizer last for only one growing season, so it has to be added every year, and every year there has to be enough rain and/or irrigation water or the crop plants get burnt by the chemical fertilizer. One tonne of compost is not enough to get a similar increase in yield immediately in the year that it is added to the soil for the first time. This is because the amount of main plant nutrients (NPK) found in one tonne of compost is lower than that in 100 kg of chemical fertilizer. However, the effects of compost last for two or more growing seasons. In Europe where the soils are cold and there is much rain, the general guideline is that 20–25 tonnes of compost are needed to replace 100-150 kg of chemical fertilizer. The range is because the nutrient content of compost depends on the materials used to make the compost. Compost made only with plant materials usually has a lower nutrient content than compost made by including animal dung and urine. In Ethiopia, more research is needed to find out how much compost is needed to get good yields in the different agro-ecological zones of the country. However, in Tigray, it has been found that compost added at the rate of 3.5–10 tonnes per hectare can give greatly improved yields, which are as good if not better than those from chemical fertilizer (see Edwards et al. 2007). 1) Mature compost to give a rate of 8-10 tonnes per hectare can be achieved in areas where there are plenty of composting materials, a good water supply and labour. Farmers working in groups are more likely to be able to produce large quantities of good quality compost than farmers working alone. These quantities have been achieved in Adi Abo Mossa village in Southern Tigray and Gimbichu district in Oromiya Regions. Some of the farmers producing bioslurry compost are also able to produce large quantities of compost in order to apply 8-10 tonnes per hectare on their fields. 2) Mature compost to give a rate around 7 tonnes per hectare can be achieved where there are medium amounts of composting materials, and water and labour are available. These quantities have been achieved by farmers working in Central Tigray near the town of Axum. 3) Mature compost to give a rate of around 3.5 tonnes per hectare can bring improved yields. This can be achieved even in areas with low availability of composting materials, as long as there is enough water to moisten the composting materials. These rates have been achieved by farmers in the semi-arid eastern parts of Tigray. 4) Where there are only small amounts of composting materials, e.g. for farmers who have very small plots of land and for women-headed households, working together to fill a common pit can make better quality compost than working alone. 5) If only a small quantity of compost is made, it is important to apply it properly to a small piece of land to make it as useful as possible, instead of spreading it thinly over a wider area. 6) Soil given compost in one year will not need it again in the next year as the good effects last for more than one growing season. The new compost can then be used for the part of the field that had no compost the previous year. Farmers that are able to apply the equivalent of 8-10 tonnes per hectare say that the good effects last for up to 3 years. 7) The study by Hailu (2010) indicated that the amount of compost applied per unit area varies based on the type of the soil and crop but generally more compost is applied in sandy soil and for the taller crop plants, while less amount of compost is applied in clay soil and for the smaller plants. For example, when a field is sown with teff, which is a small crop, an application of compost at a rate of 2.8 t/ha in clay soil and 4.8 t/ha in sandy soil can significantly improve the yield of both grain and straw. On the other hand, when a field is sown with barley, wheat or finger millet higher amounts of compost are applied than for teff (Table 4). According to the farmers, application of this amount of compost results in them getting better yields without the plants lodging as can often happen when chemical fertilizer is applied at the recommended rates. Any legume crop	No application rate is identified. The type and amount of biomass available varies from season to season (Figure 13). This is because all types of composting materials are not available through out the year. The results of Hailu’s study clearly showed that most of the green composting materials are available between July and October with the highest amounts in August and September. Dry materials, which can be stored, are available between October and March. During the dry season, water and green materials are in short supply, except in irrigated areas (Figure 13). Green materials are not easy to store for any long period. Farmers’ recommended season for compost making in Tahtai Maichew district near Axum is at the end of the rainy season i.e. August to September. However, it is possible to prepare compost through out the year based if there is a good source of compostable materials as well as water. If a farmer has a biogas digester plant that is fed every, the bioslurry effluent produced is over 90% water, so farmers do not need to get additional water to make compost. They only need to add other composting materials as described above. The crop and straw yields show that 6.4 t/ha of compost applied to the soil produced an equivalent yield to that from the application of 150 kg of mineral fertilizer in the clay soils of the Axum area (Hailu, 2010). The optimum number of animals with a farmer to produce 6.4 t/yr of compost is 3 cows and/or oxen. In the Axum area, 68 percent of the families owned the recommended number of cattle, while 24 percent of them could get enough animal manure to produce 3.2 tonnes of compost. The remaining 7.8 percent of the households studied were without domestic animals. However, in addition to the animal holding improving biomass management makes a difference in the biomass availability. Whenever farmers practiced good biomass management such as collecting and storing the weeds, animal bedding and left overs from feeding animals the farmers’ capacity to produce more compost improved. The following factors need to be discussed and decisions made in order to prepare enough compost for a chosen piece of land. Making and using compost correctly needs labour, so farmers and their families have to be prepared to work hard to make good compost, and get good results from using it correctly. Every farmer, agricultural agent, supervisor and expert working in the area should be convinced about the use and importance of compost. If everyone is convinced, then all will be willing to work hard to get good results. Farmers and their families need to identify the materials in their fields, compounds and surroundings that can be used to make compost. The pit or pits for making compost should be near the source of materials, like the edge of a field for weeds and crop residues, or inside or near the family compound for waste from the house, home garden and animal pens. Farmers living near small towns and villages may be able to arrange to collect waste materials from the houses, hotels, and other institutions where food is made in the town or village, or have the waste materials brought to an area convenient for a group to make compost together. The youth in a village or small town can be trained to make compost from the wastes in the town, and to use it to grow their own vegetables or sell it to the farmers. Farmers should work with their development agents, supervisors, experts, and other persons to help them make decisions about how to make compost depending on the local availability of composting materials, the place where the compost is to be made and the fields where it is going to be used to improve the soil and crop yields.